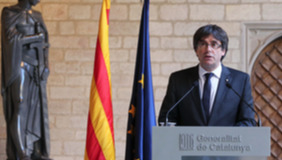 President Puigdemont: "It is the Parliament's duty to proceed on the application of Article 155 against Catalonia"
In these last hours, before my authority to hold parliamentary elections expires as a result of the measures proposed by the Spanish government in the application of Article 155, I considered the possibility of exercising it and calling for an election. It is my power and various people have asked me these days if I thought to exercise it or not. It is my duty and my responsibility to exhaust all, absolutely all, of the ways toward a negotiated and agreed solution to a conflict that is political and of a democratic nature. I was prepared to call for these elections as long as there were guarantees that would allow them to be held with absolute normality. There are none of these guarantees that today justify the call for parliamentary elections. My duty was to attempt it honestly and loyally to avoid the impact of Article 155 on our institutions, as approved by the Council of Ministers and as it will receive the approval of the Senate. It is an abusive and unfair application that lies outside of the law and which seeks to eradicate not only our sovereignty but also the whole tradition of Catalanism that has brought us to this point. I do not accept these measures because they are unjust and because they hide, almost without concealing it, the vindictive intention of a State that was defeated on October 1st. There has been no intention to stop the repression or ensure the conditions where violence is absent if said election were to happen. I have tried to obtain these guarantees. I believe I have acted in accordance with my responsibility and have taken into account the opinion put forward by people from the different political options. But this has not produced, once again, a responsible answer by the People’s Party, which has taken advantage of this option to add more tension at a time when what is needed is maximum distension and dialogue. At this point, and of course without signing any decree of dissolution to hold elections, it is the Parliament’s duty to proceed with what the parliamentary majority determines in relation to the consequences of the application of Article 155 against Catalonia. No one will be able to reproach the will of Catalan side to engage in dialogue and politics. No one can say that I have not been willing to make sacrifices to ensure all the efforts were made to open dialogue. But once again, we are finding, with much disappointment, that responsibility is only demanded and pressed down on some, while others are allowed to act absolutely irresponsibly. It is the logic of a policy based on the cries of ‘go get them’ rather than ones based on ‘let’s go with them’. The Catalan society, mobilized, has led us here on the basis of participation, commitment and serenity, but also responsibility. I have tried, throughout my presidency, and in these days that remain, to complete this path with the very same commitment, the same serenity. Everyone has their own responsibility. Mine, as a president, was to exhaust all the options that I had at hand. The Catalan people have always acted as this Government has by invoking peace and civic duties, practicing peace and civic duties, exercising peace and civic duties. It is necessary that in the coming hours our commitment to peace and civility remains stronger than ever as this is the only way, I underscore, the only way that we can end in victory.